The Visitation of the Virgin Mary is surely one of the most beautiful stories in the Gospels, the account of a younger woman’s act of charity towards her older kinswoman, at a time when both find themselves unexpectedly pregnant. It is the occasion on which St Elizabeth, John the Baptist’s mother, speaks to the Virgin the words which form the second part of the Ave Maria, “Blessed art Thou among women, and blessed is the fruit of Thy womb.” Mary’s reply to her is the canticle which in the Western church is sung at Vespers every day of the year, the Magnificat. Despite the importance of this story, the Roman Rite originally read it only on the Ember Friday of Advent, in a Mass that makes no other reference to it, two days after reading the Gospel of the Annunciation. For many centuries, the latter was one of the classic group of four Marian feasts, along with her Nativity, Purification and Assumption, which the Latin Church had received from the Byzantine Rite in the first millennium. At the end of the 13th century, the liturgical commentator William Durandus notes that some people celebrate a fifth feast, that of the Virgin’s Conception. This feast was the cause of some notable discussions and controversies, and was not received by the Roman Church until 1476, more than 200 years after it was first kept by the Franciscans. The Visitation, on the other hand, was officially embraced and promulgated almost a century before the Immaculate Conception, and properly ranks as the Latin Church’s first “new” Marian feast, a native creation of the Roman Rite, not a Byzantine import. 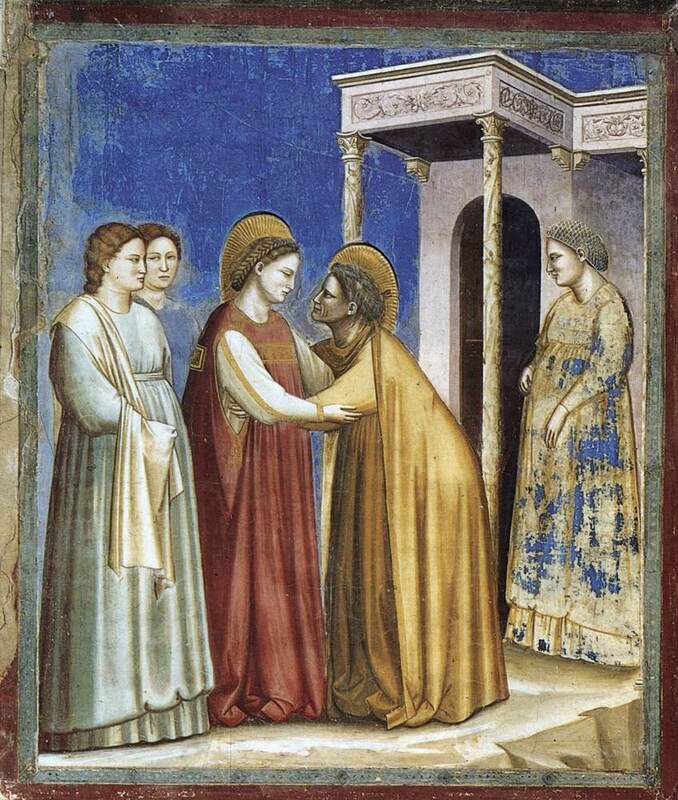 The Visitation of the Virgin Mary, by Giotto, in the Scrovegni Chapel in Padua, Italy, 1303-6. It is traditionally said that the Franciscans adopted the feast, along with that of the Immaculate Conception, at a general chapter held in 1263, when St Bonaventure was Minister General. It is certainly true that St Francis’ order greatly promoted devotion to the Virgin and new feasts in Her honor, also adopting the feast of Our Lady of the Snows in 1302. Evidence for their celebration of the Visitation in the 13th century, however, is not conclusive, and the authenticity of the relevant sources is debated. The first certain attestation of the feast is found in Prague, where it was celebrated in 1386 at the behest of Archbishop John Jenstein, who composed a Mass and Office for it. Cardinal Jenstein was also present at a consistory held in Rome in April of 1389, as the Great Schism of the West was in its twelfth year, and it was he who suggested to Pope Urban VI that he extend the feast to the whole Church as a way of asking for the Virgin’s intercession to end the Schism. The very Queen of heaven, in whose womb the Son of God enclosed Himself and became a man, from the height of that great honor proclaimed to her by the Angel, took unto herself no spirit of pride, but as a humble servant, though she had become the mother of the Lord, fulfilled the office of her humility, upon which the Lord had looked with favor, and arising went unto the mountains, … O great mystery, o wondrous commerce, and ineffable sacrament, that these mothers should know beforehand and even prophecy about the children which they bore in their wombs; and, as the sacred history of the Gospel reveals, the Queen of Heaven, who was pregnant, and would be consecrated by the birth of God, as an even greater mark of humility, should render service to the pregnant mother of Her Son’s Precursor. When the feast was first kept at Prague, it was celebrated on April 28; other dates are attested in other places, but Pope Boniface’s bull fixes it to July 2nd, the day after the Octave of the Nativity of St John the Baptist. This may seem an odd choice, since the Visitation comes right before the Baptist’s birth in St Luke’s Gospel. Wishing to keep the feast with the fullness of solemnity according to the custom of his era, Pope Boniface originally gave it a vigil and an octave; both of these were removed in the Tridentine liturgical reform, although the octave was retained by many religious orders, and all the dioceses of the kingdom of Bohemia. Vigils were not kept in the Easter season, and if the feast were set in May or June, its octave would continually clash with those of the Ascension, Pentecost and Corpus Christi. (The date of the Visitation in the Novus Ordo, May 31, will fall on the Ascension, Pentecost, Trinity Sunday or Corpus Christi 13 times in the current century; adding the vigil of Pentecost, its octave and that of Corpus, it will be impeded a further 42 times). By the end of the 15th century, the July 2nd date had been received throughout the western Church, even at Prague, and this is the date that would carry through to the Tridentine liturgical books. In the Ambrosian Rite, the Visitation is ranked as a Solemnity of the Lord, and as such, may be celebrated on a Sunday, which is not permitted even for the very greatest solemnities of the Saints, such as the Assumption or the feast of St Charles Borromeo. Nevertheless, the texts of both Mass and Office are essentially about the Virgin Mary. The major exception is the first chant of the Mass, the “Ingressa”, repeated from the Sixth Sunday of Advent, which speaks of the first meeting of the Lord and His Precursor as children in their mothers’ wombs. The Byzantine Rite also keeps July 2nd with a feast of the Virgin, called “The Placing of the Honorable Robe of the Holy Mother of God in Blachernae.” Blachernae was the name of a suburb of Constantinople, later enclosed within the city walls, where in the mid-5th century the Empress St Pulcheria built a church dedicated to the Virgin Mary; this church would become the city’s most important Marian shrine, and among all of its churches second in importance only to Hagia Sophia. Shortly thereafter, two citizens of the imperial capital were said to have found the robe of the Virgin Mary while visiting the Holy Land, and to have brought it back to the city, where it was enshrined in the church at Blachernae; an ancient icon of the Virgin was also housed therein, of the type now called from it Blachernitissa. The Synaxarion of the Byzantine Rite (the equivalent of the Martyrology) tells the story that when Constantinople was besieged by the Avars and Persians in 626, the patriarch Sergius processed various relics around the city walls, including those of the Cross, and the Virgin’s Robe. 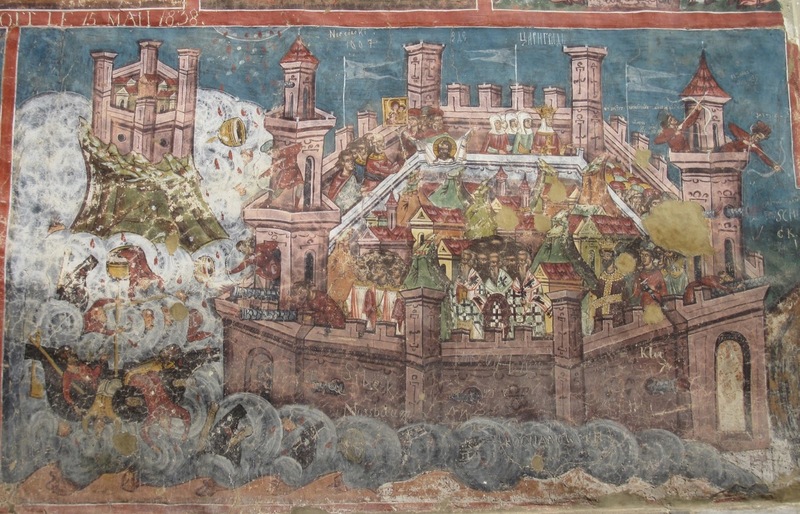 Shortly thereafter, the besieging armies were completely defeated by the much smaller Byzantine forces, and the enemy fleet wrecked just off the shores of the Blachernae region. The Byzantine tradition states that the famous hymn to the Virgin known as the Akathistos was first sung on this occasion, to honor the Mother of God for protecting and delivering the city. The Virgin of the Blachernae was believed to have delivered the city from at least three other sieges, twice by the Arabs in 677 and 717, and again by the Russians in 860; the icon and robe of the Blachernitissa came to be venerated as the palladia, the protecting talismans of the city. 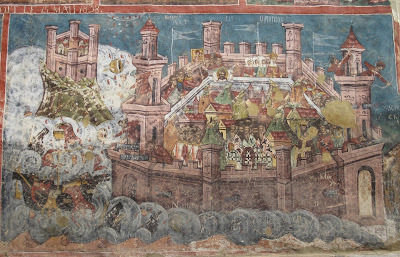 The Siege of Constantinpole, in a mural of the Moldovita Monastery in Romania, painted in 1537. (Image from wikipedia; click to enlarge.) On the upper part of the city walls are seen the Blachernitissa icon of the Virgin, and the Holy Mandylion, the cloth with the face of Jesus on it. Later Byzantine writers tell of a miracle which took place in the church so often it came to be known as the “habitual miracle.” This tradition found its way to the West, and is recorded in the rubrics of the Missal of Sarum, as an explanation of the custom of celebrating a Mass in honor of the Virgin every Saturday. In a certain church of the city of Constantinople, there was an image of the Blessed Virgin, before which there hung a veil which covered the whole image. But on Friday after Vespers, this veil withdrew from the image, with no one moving it, by a miracle of God alone, as if it were being born up to heaven so that the image could be fully seen. Once Vespers had been celebrated on Saturday, the veil descended once again before the image, and remained there until the following Friday. Once this miracle had been seen, it was decreed that that day should always be celebrated in honor of the Virgin. The rubric continues with a beautiful meditation on the Virgin Mary’s faith in the Resurrection. Another reason is that when the Lord was crucified and had died, as the disciples fled and despaired of the Resurrection, complete faith remained in Her alone. For She knew that She had carried Him without distress, and born Him without pain, and therefore she was certain that He was the Son of God, and must rise from the dead on the third day. And this is the reason why Saturday (i.e. the day between the death and Resurrection of Christ) belongs more than any other day to the Virgin. 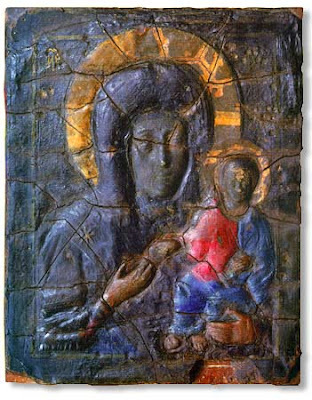 A 17th century copy of the Blachernitissa icon of the Virgin Mary, from the Tretyakov Gallery in Moscow. The original seems to have been lost when the church of the Blachernae was destroyed by fire in 1434.